Now that its official, it might be time to announce the return of Legends of the High Seas at Adepticon 2014. Pirate gaming has been on the back burner for a couple years now but the interest and demand is still there, so after a bunch of back and forth I was eventually keelhauled back in to run it. I am quite confident already that with some help from Tim , the rule books author, and some other fine folk all ready secured it is going to be one hell of a game! I am running it as a big game this year rather than a traditional tournament, however its a 3 stage game so it will have that down home tournament feel. We are assembling a really great board of terrain old and new, and in honor of the most successful pirate on record and all those entertaining Rum commercials its themed on Captain Henry Morgan. 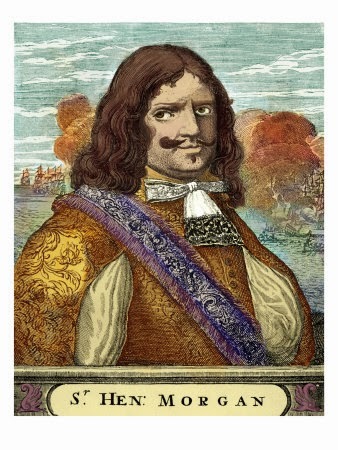 In December 1670 and January 1671, Henry Morgan, one of the most notorious and successful pirates on the Spanish Main, destroyed Fort San Lorenzo and Burned and Sacked the City of Panama. The utter chaos that followed was a payday for Pirate and Pirate Hunters alike. Be one of 10 Privateer, Pirate or Royal Navy Crews that explore the ruins of Fort San Lorenzo and the City of Panama searching for plundered Spanish gold. Bring your Crew comprised of up to 15 men and face off on a 48 Square foot board to capture objectives, eliminate enemy crews and capture as much gold as possible in this 3 Stage, 4 hour event. In the end, only one players name will rival that of Henry Morgan, but they will damn sure know the names of the ones who almost stopped them! Awards for the top two scorers and Best Painted Crew! 10 spots , $10 dollars, given the interest on our local forums and my inbox this should sell out right away. 2012 event most the work is done, slight changes to tailor to the event. excited to get back pirate gaming, you know we will run a demo of this event at the house before Adepticon...Arghhhh. Didn't find much time to hobby this weekend, with Pumpkin Patches, a broken fridge, plenty of house work and Halloween coming up, I barely had time to base up and prime a second faction for Empire of the Dead. Fitting with the Halloween theme here is most of the new Order of the Dragon figures, which are the Nosferatu faction for the game. the Mad Man (Renfield) and a Thrall with a Gatling Gun (not pictured) The other figures are masked Order of the Dragon Thugs, a separate 4 figure set. No Guardian with the new figures (yet?) but there are plenty of other figures in the Kickstarter exclusives that can fill that role. Versus the Unwitting Policemen of the Supernatural Branch, A Detective and Sergeant, 2 Constables and the Firearms Constable, they might seem a bit outmatched at the basic level but the Police are packing a Shotgun and the Gatling Gun so we will see how that goes. The first week of this month I received my Kickstarter package for the new launch of Empire of the Dead by Westwind Productions. Titled "Empire of the Dead: Requiem" its complete overhaul of the game with a whole bunch of new factions , figures and vehicles. The original game had 5 starter boxed and worked in conjunction with Westwinds previous Vampire Wars line. With this big Kickstarter release the game is now fully developed with its own line. I'll talk about the game play at a later date, I am planning on playing some Demos on Tuesday evening. But needless to say if you are a fan of the GW skirmish rule sets, like Mordheim, Lord of the Rings and the "Legends" games you are going to enjoy this. Just primed and basecoated, bases by Secret Weapon. Because I am seriously in the weeds getting my Lord of the Rings stuff ready for Bilbo's Birthday Bash, I have barely had time to go thru the EotD stuff, but tonight I took a break and did. I modeled up, primed and basecoated my first faction, The London Police's "Supernatural Branch", in which I also included Sherlock Holmes, and Dr Watson. The 8 models outside of Holmes and Watson are set 2 of the available Police figures, and includes the Steampunk Infernium Hound. I plan on working on my second faction, The Nosferatu., this weekend. I'll probably get into finishing the paint right after BBB concludes in early November. I took a few minutes to figure out how I wanted the Blues to work. With GW games falling totally off my Radar, and Lord of the Rings, er,, excuse me ,"The Hobbit SBG" winding down for a host of reasons, I've been looking for good skirmish game to get into and I am hoping this is it, I love the setting as old school Gothic Horror fan with touches on so many other fantasy and Science Fiction elements from classic literature, its drippy with that classic nostalgia from my youth that made me such LotR fan. Moving ahead, I pretty sure beside our Ancients gaming , EotD and Bolt Action are the games I will be playing. Love this Holmes and Watson pair, can't wait to paint them! A couple things I want to point however if your interested in taking the plunge. # 1 these miniatures are true 25'smm the don't scale well with Reaper or GW miniatures they are roughly the size of the older GW LotR plastics. The do work perfectly with alot of the Hasslefree miniatures stuff which was a pleasant surprise as I picked up some Hasslefree stuff a few years back for a project and couldnt use it due to the scale disparity of the other figs I was using, and now I have use for them! #2, Kudos to Westwind Productions as this was hands down the best Kickstarter I have been involved in as far as backer communication, and product delivery all clearly spelled out and on time, Also delivery to backers first before any retail sales which I guess starts in November. That is super positive sign these guys have it together so if you want to invest in a new games from a small company. This is a good barometer of their business practices. When I awoke this morning I was greeted by an email from Reaper announcing the launch of Bones II. when I checked in on the Kickstarter page, after grabbing my morning coffee, it had already hit well over 300K or 300% of its goal. Now I get home from work its at 750K and still "Cha-Chinging" away with no signs of slowing down- this is just day one people. I have to ask, and maybe you can help me...but who, exactly is buying these things? while the first Bones was a great deal for its $100 Vampire pledge and the resulting bonus rewards . Its almost universally agreed upon by the miniature collecting blogosphere that Bones was an exercise in mediocrity. from the odd bendy material to the shallow detail, to difficulties people having getting paint to stick to it. In general I have observed that people who just want miniatures for RPG's like pre painted ones and I didnt see the feedback on Bones from the greater community that this was anything more than a very successful stunt with mixed results based on people's personal tastes. Nothing that would quite justify the very possible 1 million dollar 24 hour opening, or at the very least first 48 hours. Now dont get me wrong I like my stuff from Bones I , they have there uses, But do I already have way more then I will ever need, before Bones 2? Yes. Would I much rather Reaper get back to it regular release schedule instead of it being stopped almost to a crawl in the wake of servicing Bones?. Yes. Would I and many others rather have the metal figures with a wider Bones selection for cheap rank and file troops, and not the entire Reaper catalog converted to Bones? Yes. So I have to ask again who exactly is buying these at these amounts and level of interest? I must say I dont get it. I'll gladly take select Reaper metals and some select Bones figs for various gaming purposes..but another 200 bendy plastic figs with hit or miss details, No thank you. I guess if you are buying into Bones 2, thanks for expanding the line for the rest of us that want to cherry pick Bones figures, but this must be disconcerting to other long time Reaper fans other than myself when there hasnt been a Dark Heaven or Chronoscope new release in pewter since February.